Chang Fee Ming, the Chinese artist, is currently exhibiting over 200 watercolors at the Chiang Mai University’s Art Museum (CMU) on Nimmanhaemin Road. 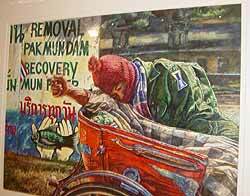 Entitled “Mekong”, the exhibition will run until May 28. 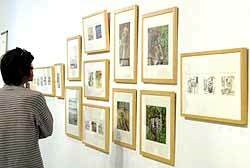 A guest reviews the artwork at the exhibition. Chang Fee Ming said his inspiration of his artworks arose from his travels since 1994 through six countries located along the Mekong River. During his journeys, he spent time talking with many communities and collected many memorable pictures through postcards and sketches. When he was back in his lodging, he added more detail to each picture, he explained. As a result, he possessed many sketches and drawings and converted these to watercolors. “Demonstration’s Dream”, Mun River, Ubon Ratchathani. His pictures involve streams, the strident noise of markets, the environment, harvesting, religious rituals and daily life. The exhibition includes 30 small sized portraits, 26 large sized portraits and 14 small sized watercolor pictures. These artworks were created during 1977-2003 and have never been on display before. Chang Fee Ming decided on watercolor as a medium because he could apply elasticity and change the colors to match his emotions, he says. The color also corresponds with the Asian identity rather than oil colors since oil colors give excessively dazzling tones. Associate Professor Thada Martin, dean of the Fine Arts Faculty, presided over the opening of the exhibition on May 8. A six hour odyssey through contemporary Italian history; an Oscar-nominated Dutch tale of a half-century rift between twin sisters; the hopes, fears, emotions and insecurities of ten actresses as they vie for the big break; and a Slovakian boy who can talk to the animals. 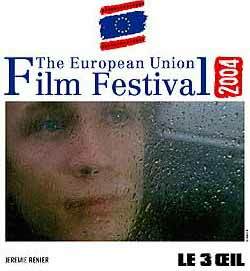 These are some of the highlights of the upcoming European Union Film Festival 2004 organized by the Delegation of the European Commission and the Embassies of the European Union (EU) Member States. The Third Eye - Belgium (Monday, June 7 at 7 p.m.) Michael, a small-time crook, meets Malika who helps him hide. A fragile relationship blooms and Malika discovers she has clairvoyance - the third eye. She tries to use her powers to force destiny. Featuring 24 films from many of the 25 countries of the EU, the festival is co-organized with the Major Cineplex Group. The Festival comes to the Major Cineplex Chiang Mai from June 1-13 before breaking new ground when it takes place in Udorn Thani for the first time. Admission for Chiang Mai screenings will be 70 baht; and for Udorn Thani 60 baht. All films will be shown in the original language with English subtitles. The EU Film Festival aims to bring better understanding of the EU through cultural interaction. As in past years, the festival will bring some of the very best in recent European cinema to Thailand. All the films are highly acclaimed, having been shown at Europe’s most prestigious film festivals and will allow Thai audiences to experience the highly diverse nature of life within today’s EU. A major difference this year will not only be the change of venue, but also the changed times of screening to enable more working people to see the film of their choice. Weekdays the first movie of the day will be shown at 7 p.m., while on weekends the screenings start at 5 p.m. The schedule of the movies will appear in Chiangmai Mail next week. For ticket reservations please contact: Major Cineplex Chiangmai 0 5328 3939 and Udorn Thani 0 4223 0439. The Koto Project from Japan has lent a hand to support handicraft merchandisers in Chiang Mai. 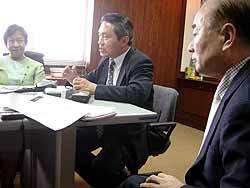 Ozaka-based Phatai Suksommai, director of the Japanese Foreign Trade Promotion Office, held a press conference at the Industrial Promotion Center in the city, to which representatives of Japanese businesspersons of handicraft products were invited. The Japanese businessmen met with the Department of Export Promotion (DEP) staff at the Industrial Promotion Center (IPC) for business talks. They included Kiyoshi Yamada, consultant in production and marketing for Jtitro Co Ltd; Miyoko Mizono, president of Wabi Design Co Ltd which specialises in the manufacture of lamps and handicrafts; Fumiaki Yamato, president of Yamato Planning which produces kimonos; and Mamoru Sato, president of Meblus IT Co Ltd. They were in Chiang Mai to strengthen Thai-Japanese cooperation in handicraft production. Chiang Mai will serve as handicraft manufacturer and exporter of products with modern design and patterns to Japan. It is expected that the handicraft industry will generate a lot of money for the city in the future. Phatai said the name “Koto Project” came from Kyoto, Japan’s former capital city, “Which is similar to Chiang Mai, a former capital city of Thailand”. They would use this similarity as a selling point for their products. “There are many similarities between the two ancient cities, such as both being major manufacturer of handicrafts,” he added. “The handicraft industry in Japan has weakened because Japan is concentrating on the production of cars, ships and electronic appliances instead. Even though the income from handicrafts can’t be comparable to that of the industrial sector, handicrafts add value to art and culture itself. “As a result, Japan realizes the necessity of handicrafts but it is not easy to produce them because of the high salary levels and because only a few of the old craftsmen and women remain,” said Phatai. All these factors helped Japan decide to collaborate with Chiang Mai and let it be a major source of handicraft products for Japan to import. This will be advantageous for both sides and the business partnership deal is expected to be signed soon. During their visit, the Japanese businesspersons met many Chiang Mai entrepreneurs of Sa paper, silk, carved wood and ceramics products, from both small and medium enterprises and OTOP (One Tambon One Product) projects. The Thai entrepreneurs are being encouraged to submit their original handicraft products for Japanese designers to modify to blend contemporary Thai and Japanese styles, hopefully to make their products more desirable to the Japanese market. The entrepreneurs will learn useful new techniques on product design and administration from Japan. Phatai continued that Japanese people are very interested in Chiang Mai handicrafts and when they want to buy handicrafts, they would head for Chiang Mai. Northern cloth handicraft, wickerwork, silverware and ornaments exported to Japan earned an estimated 5-6,000 million baht a year, he said. Oriental-style products, especially handmade ones, are currently very popular among Japanese customers. No matter what your nationality, color or religion, the Northern Insight Meditation Center says you can improve your life and mental development through the practice of Vipassana or Insight Meditation. The Northern Insight Meditation Center at Wat Ram Poeng (Wat Tapotaram) can guide you on the path of a peaceful life with your correct understanding of yourself. All you need is determination. Under leafy canopies, five meditation students of different ages are performing the three steps of meditation practice. The girl in the foreground is mindfully prostrating in front of the Buddha image, whereas the other three in the background are mindfully walking, with mindful sitting being practiced by the boy at the rear. Located near the back gate of Wat Ram Poeng, the center is in a shady area with leafy canopies, green potted plants, and birds humming above in the trees, offering you a sense of tranquility. There are two sections, with the larger for Thai meditation students, while the smaller section caters for foreigners. “We do not accept anyone and everyone who arrives here, but screen them first to see whether they come with resolve and will not cause trouble to other meditation students,” said Phra Ajarn Chaibordin, the monk teacher who supervises and oversees meditation students. Interested students apply from a wide variety of countries including America, Australia, Finland, Germany, Greece, Japan, Portugal and Switzerland. They are not just Buddhists. While most are followers of Buddhism, Christianity, Judaism or Muslim, some practice no religion. 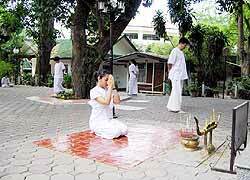 Wat Ram Poeng provides a 26 day course in Vipassana under the supervision of a teacher. However, those who do not have enough time to join the full course, the temple offers the opportunity to experiment in the practice of Insight Meditation for 10 days. There are also six week courses offered. Anyone reading through the general rules for meditation students will immediately realize why applicants are thoroughly screened first. The rules include the following: The clothing worn both day and night must be white, and kept clean. The clothing for men: white trousers and shirt. Women must wear a loose white sarong or trousers and a loose white sleeved shirt with white sabhai (scarf worn over the chest and around one shoulder). White underwear is a must for both men and women. Every meditation student is prohibited from talking, discussing or comparing their personal practices or experiences of meditation with others and they are not allowed to mix other techniques with their guided meditation practice. All meditation students are provided separate rooms and visitors are not allowed. The meditation students are also not permitted to socialize, gossip, read - not even books about Buddhism - write letters or diaries, listen to radios, tapes, CDs, or make telephone calls. Mobile phones must be left at the administration office until the end of the course. The temple authorities also have the right to refuse entry or eject anyone who does not respect the rules. The daily routine starts at 4 a.m. with the practice of “mindfulness”, which is the heart of the Buddha’s teaching. The chronological steps begin with the mindfulness of prostration, walking meditation and then sitting meditation. After a full day, at 10 p.m., the students may go to sleep, still dressed in white as during the day. “People who are interested in the course are to call three weeks beforehand and a confirming call, on their arrival in Thailand, must be done,” added Phra Ajarn Chaibordin. However, the center is fully booked until at least May 25. The temple does not charge a fee for the meditation course, but donations are appreciated. The Northern Insight Meditation Center, Wat Ram Poeng (Wat Tapotaram), is located at No. 1, Moo 5, Tambon Suthep, Amphur Muang, Chiang Mai, 50200, Thailand. Office hours are 8.30 a.m. to 5 p.m.